I am so pleased how everything turned out today! I think this is the most well organized and busy day this summer. 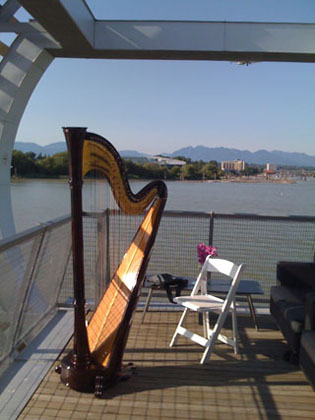 I had 5 weddings booked, with the perfect amount of time between each one to move the harp etc. Of course, I couldn't have done it without my husband moving everything for me - best roadie in the world! The first 4 weddings went beautifully and I had some fun requests like Taylor Swifts, "Love Story" and "River Flows in You" by Yiruma (Bride was a huge Twilight fan). They sounded gorgeous on the harp so I've now added "River Flows in You" to my music section (have a listen if you don't know it, it's very pretty - it's under the Prelude section). So, last wedding rolls around and I'm pleased as pie that everything was great and I just felt like playing the harp all day long - could have even played more! This last wedding was G&D's big day and held at the UBC Boathouse, which sounds like it would be at UBC, but is in Richmond, just off in the water of River Road. It's where the Rowing team practises from and also houses a wonderful floating banquet facility. It's bright, modern, and I think quite fun for guests to see a venue they wouldn't have seen normally. 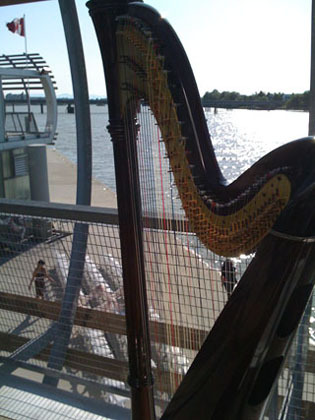 G&D had their ceremony right by the water and my harp was placed on a balcony looking down. The sound the harp was checked and carried nicely to the guests. With the sun setting, and the breeze from the water coming in, I just felt so relaxed and all the guests seemed to be having lots of fun.